Beckett Miles, 5, at left, gets some help from his friend Kolston Hulegaard, 7, as they work on decorating socks for local nursing home residents Fridday during the Kindness Challenge Action Day at Manson Northwest Webster Elementary School in Barnum. 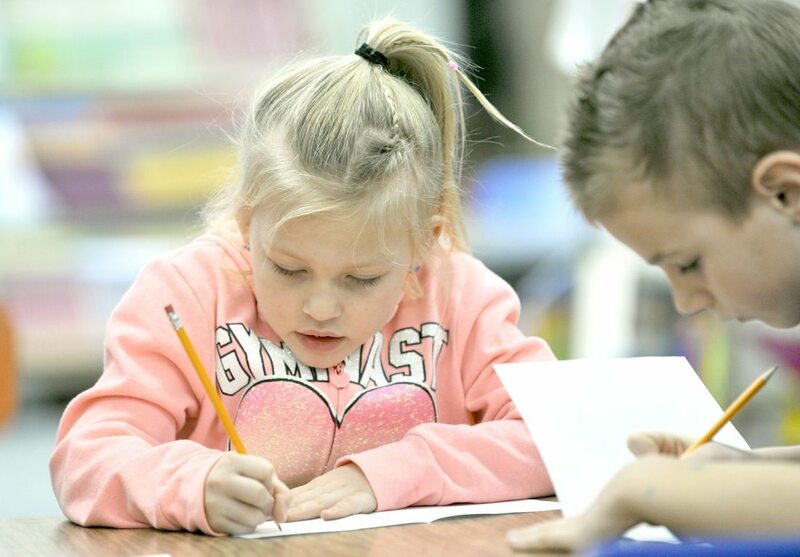 Millie Egli, who is adamently six and a half, works on making a card Friday afternoon during the Kindness Challenge Action Day at Manson Northwest Webster Elementary School in Barnum. 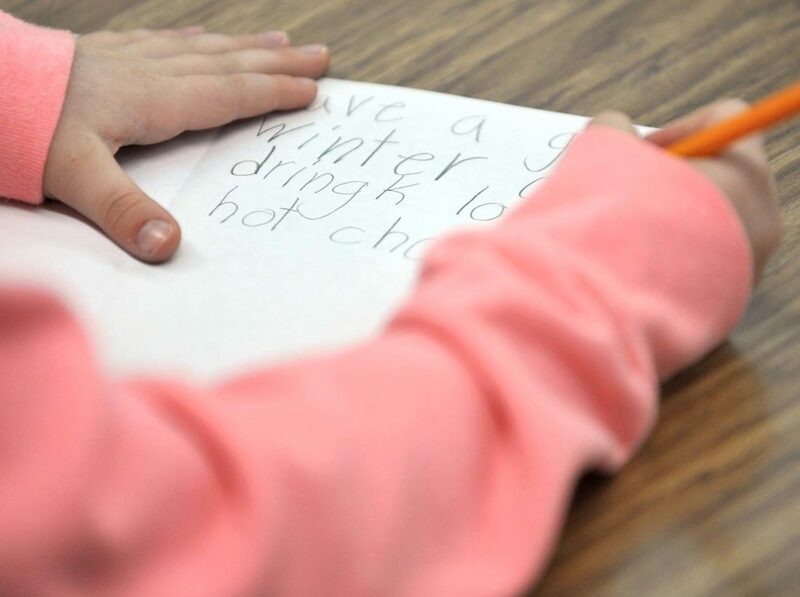 -Messenger photo by Hans Madsen Millie Egli, 6, works on her personal greeting card message during the Kindness Challenge Action Day at Manson Northwest Webster Elementary School in Barnum. The students at Manson Northwest Webster Elementary School in Barnum created a wide variety of decorated socks for local nursing home residents during the Kindness Challenge Action Day. 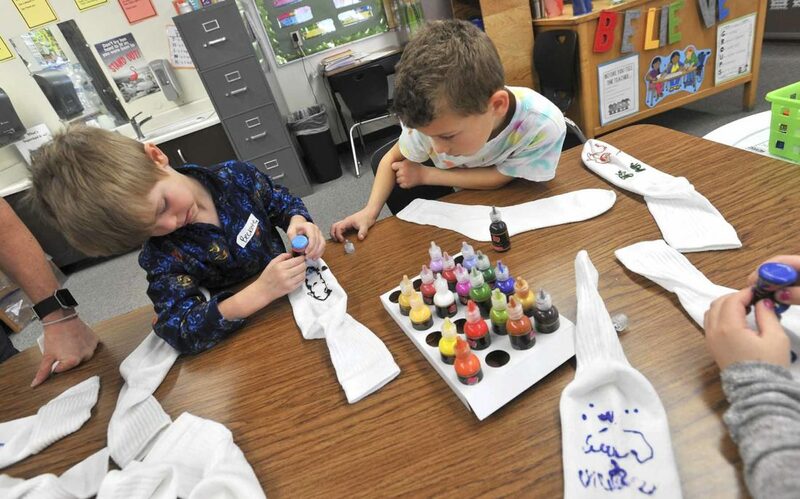 BARNUM — In a room full of students working on decorating no-skid socks to donate to residents of local nursing homes, Manson Northwest Webster Elementary School first-grader Kolston Hulegaard, 7, was demonstrating his own act of kindness. He was helping Beckett Miles, 5, get the hang of opening the squeeze bottles and applying the paint. The students were working on a variety of projects as part of the annual Kindness Challenge Action Day. The socks will go to nursing home residents along with a card made by the students. They are also tying blankets, making snowman soup, bookmarks, place mats, kindness notes for veterans and several other items. Kindergarten teacher Jan Nelson organized the day. She hopes the students learn what it means to be kind to each other and hopes that they remain kind and caring for the rest of their lives. The idea is for the acts of kindness to spread out like ripples in a pond. The students take the kindness attitude home, share it there and then take it with them into the community. Some of Friday’s kindness will reach way south. 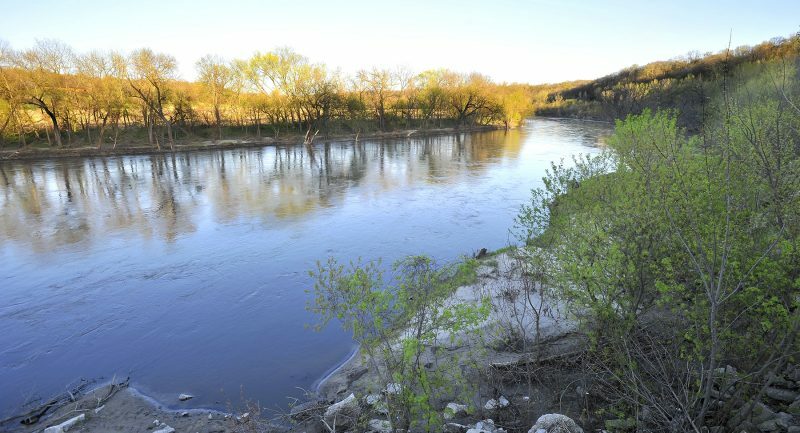 “The blankets are going to Texas to a school that was hit by a hurricane,” Nelson said. The students helping with the blankets were able to Skype with the students in Texas to let them know the blankets are on the way. “They were really excited,” she said. There’s also a local connection. 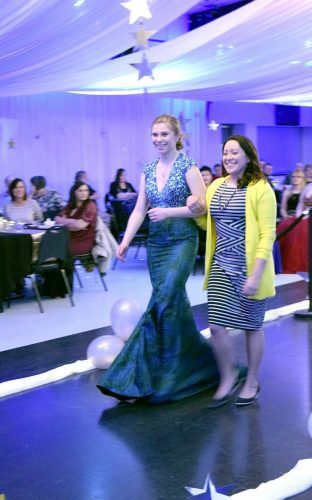 Their teacher, Miranda Olson, graduated from Manson Northwest Webster. Last year’s Kindness Challenge recognized students with hearts posted on the wall by the office. This year, in honor of the Winter Olympics, students were recognized with links in a chain that’s hanging in the cafeteria. They also have some incentive. “The class that has the most gets a pizza party,” Nelson said. She said they’re almost there. “We got to bronze, we got to silver, we’re still working on going for the gold,” she said. Millie Egli, who is not 6, but 6 1/2, wrote her own message in a card destined for a local nursing home resident. “Have a good winter and dringk lots of hot cocoa,” she wrote, accidentally misspelling the word drink. She said that hot cocoa is one of her own favorite drinks. She hopes the eventual recipient of the card likes it, too. Hoyt Hanlon, 7, kept his card message simple. “I love you,” he wrote. Both Hanlon and Egli said that doing something kind for someone else, made them feel good, too. Hanlon later found himself working to tie blanket edges. It proved a challenge. “It was hard to me to get the x through,” he said.